nxtControl will fundamentally change the world of automation. Our customers will get a commercial advantage with our innovative products. That is our primary goal, we meet this challenge with creativity, pioneering spirit, persistence and comprehensive know-how. nxtControl will fundamentally change the world of automation. Our customers get in advance with our innovative products. They master the complexity of modern automation and are much more efficient in engineering. This is our motivation – to create intelligent solutions for efficient engineering and by that ensure commercial advantage of our customers. We meet this challenge with creativity, pioneering spirit, persistence and comprehensive know-how. Today’s control technology is outdated. Future oriented concepts relay on systems with distributed intelligence. The IEC 61499 control technology is the right solution. Control technology still used these days is older than 15 years and outdated. Future topics such as Smart Grid, Industry 4.0, Internet-of-Things, energy efficiency relay mainly on distributed intelligence. Most industrial applications are distributed systems or would offer significant advantages when modelled as distributed systems. The appropriate control technology is the IEC 61499 for distributed control systems. 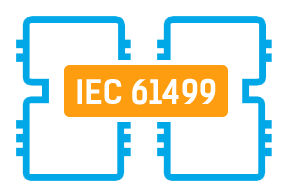 Die IEC 61499 is the successor of the IEC 61131 and it eliminates their short comings in distributing control logic in a decentralised system. The programming languages are the same for both standards. Efficiency is the order of the day not only in energy consumption but also in engineering. The solution is an engineering tool that seamlessly integrates all automation tasks. Distribution increases the complexity of control systems. We combine modern technologies to create innovative automation software for the most efficient engineering of distributed systems, irrespective of the purpose - building automation, automation of machines and manufacturing lines or process automation. We are worldwide technology leaders in the IEC61499 standard for distributed control systems. As first suppliers, we have developed a DCS (Distributed Control System) based on IEC 61499 with seamless integration from field level up to the SCADA level, in other words, a DCS with PLC performance.